This weekend, Pope Francis will canonize Pope Paul the VI along with Oscar Romero and five others. Well, we’ve got some canonizations this weekend, don’t we? Romero I get of course, but Paul VI? Really? Well, I take that back. Since I have no illusions about ecclesiastical politics and ideological agendas, sure, I get the push to canonize Paul VI. But…yeah. Tell me about all the popular devotion to Paul VI out there. Anyone? Anyone? Bueller? Well, I can't think of a "popular devotion," whatever that is, but I do credit him with keeping me Catholic through my young adulthood. I don't have a clear remembrance of John XXIII. Pope Paul was the pope of my school years. It was his picture on the wall next to President Kennedy in the blue-collar farmhouse I grew up in near Flint Michigan. In the very haziness of late childhood, I remember that he put out a letter that ticked off a lot of people. Mostly I remember him as being kind of silent and sad looking. As a teenager, I was thrilled with the Pope John Paul. He felt like a breath of fresh air and not like a pope at all - at least not what I had become accustomed to. It was not until I was much older, married and struggling with all of those new married Catholic things like NFP that I started seeing Pope Paul VI in a new light. As I studied Humane Vitae, I thought he was a genius. Now I think he was a prophet too. Many of the things he wrote about in Humane Vitae as being dangerous and sinful have since come to pass. But prophets are never appreciated in their own time. Paul VI sure wasn't. His own bishops rebelled against his teaching and lay Catholics started following the misguided theologians who told them that conscience should be their guide without telling them how to go about forming that conscience. God protected his church through Paul VI, who bravely wrote his Encyclical that saved the church from entering a grave error, scandal, and embarrassment. Pope John XXIII and Pope John Paul II were canonized together in 2014. It seemed unjust in my mind that the "Paul" part of that trio was not included. But this weekend Pope Paul, the pope that did not bend to modern trends and held fast to the teachings of the Catholic Church with regard to sexuality and family planning will be canonized by Pope Francis, the darling of the liberal media. The irony of this is not lost on me. So while there might not be a popular devotion to Paul VI per se, he had a great devotion to the Blessed Mother. In gratitude for his bravery and his beautiful encyclical, I can express that when I pray the rosary. 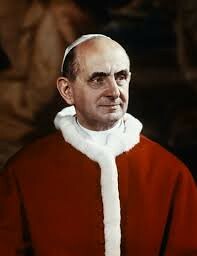 Saint Pope Paul VI, pray for us.